Put–call parity is a relationship between the price of a European call option and European put option with the same strike price and time to expiration. It is one of the most important relationships in option pricing. It provides a tool for constructing equivalent positions. This post is a general discussion of put-call parity. In the next post, we discuss put-call parity in greater details for various underlying assets – e.g. stocks, treasuries and currencies. Suppose you follow the strategy of buying a call and selling a put (at time 0) where both options have the same underlying asset, the same strike price and the same time to expiration. At time , it is certain that you will buy the underlying asset by paying the strike price . Too see this, if at expiration of the options, the asset price is more than , then you, as a call buyer will want to exercise the call option and pay to buy the asset. If the asset price at expiration is less than , then you as a call buyer will not want to exercise but the put buyer that bought from you will want to exercise the put option. As a result, you will also buy the asset by paying the strike price . Thus by entering into a long call and a short put (on the same underlying asset, with the same strike and same time to expiration), you will end up buying the underlying asset at time at the strike price . What is being described sounds very much like a forward contract – a contract in which you can lock in a price today to pay for an asset a time in the future. For this reason, the strategy of buying a call and selling a put is called a synthetic forward contract. Enter into a forward contract to buy the underlying asset by paying the forward price at time . Buy a call and sell a put today (on the same underlying asset, with the same strike price and the same time to expiration). The two different strategies generate the same payoff. Hence they must have the same cost. Otherwise there would be arbitrage opportunities. By the “no-arbitrage pricing” principle, the net cost of the two strategies must equal. The cost at time 0 of the “buy call sell put” strategy is , plus the present value of the strike price , where and represent the call option premium and put option premium, respectively. The cost at time of the forward contract strategy is the forward price . Thus cost at time 0 of the forward contract strategy is the present value of . We can now equate the costs of the two strategies. The notation denotes the time 0 value of an amount at the time . Equation (0) is one form of the put-call parity, which is a statement that buying a call and selling a put is equivalent to a synthetic forward contract. It also tells us that buying a call and selling a put plus lending the present value of the strike price is equivalent to buying the underlying asset. Other versions can be derived by algebraically rearranging equation (0), some of which have interesting interpretations. The following is one of them. The left hand side of (1) is the net option premium – the premium paid for the call less the premium received for the put. When this amount is not zero, it is in effect the premium of the synthetic forward contract (this amount is the initial cash outlay for the synthetic forward contract). This is one difference between a synthetic forward and an actual forward. Note that an actual forward contract has zero premium (the initial cash outlay is zero). Another difference is that the “forward price” of the synthetic forward is the strike price of the options and while the forward price of the actual forward is . Suppose that the strike price is chosen to be less than the actual forward price . Then the holder of the synthetic forward contract can buy the asset at a price lower than the forward price. This is certainly a benefit. In order to get this benefit, the holder of the synthetic forward contract has to pay the net option premium, which is the result of the call being more expensive than the put. In this scenario, the net payment is a little higher at time 0. As a result, the payment at time is a little less. Suppose that the strike price is chosen to be more than the actual forward price . Then the holder of the synthetic forward position is obliged to pay for the underlying asset at a price higher than the forward. It then makes sense for the holder of the synthetic forward position to be compensated by receiving a payment initially. This would occur if the put is more expensive than the call. In this scenario, the net payment is a little less at time 0, leading to a larger payment at time . 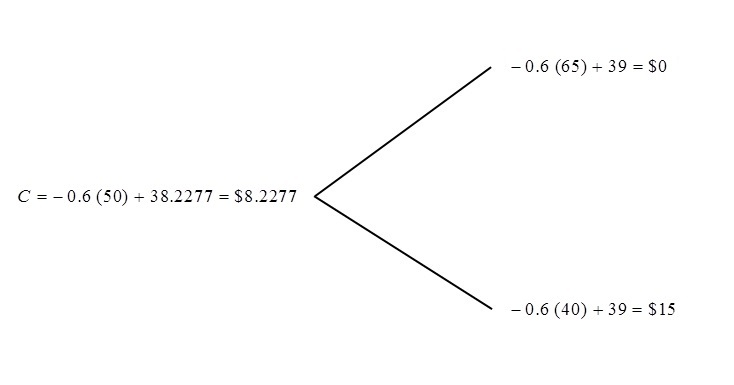 If the strike price is chosen to be the same as the forward price , then equation (1) suggests that the synthetic forward mimic exactly the actual forward (both have zero premium). For this to happen, premiums for the put and the call must be equal. 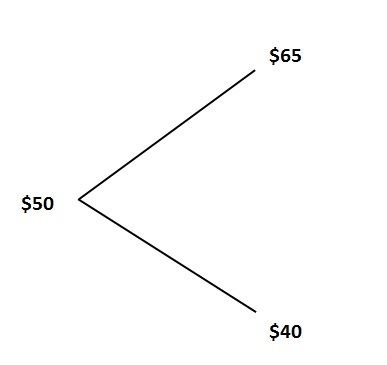 The right hand side of (1) is the value of the discount resulted from paying the strike price instead of the forward price. This version of the put-call parity says that the discount is identical to the net option premium. The left hand side of (2) is the time 0 cash outlay of buying the underlying asset and buying a put. The right hand side of (2) is time 0 cash outlay of buying a call option (with the same strike and time to expiration as the put) and buying a zero-coupon bond costing . Thus equation (2) tells us that buying the underlying asset and buying a put on that asset (i.e. a protective put) have the same cost and generate the same payoff as the buying a call option and buying a zero-coupon bond. Adding a bond lifts the payoff graph but does not change the profit graph. Thus buying the asset and buying a put has the same profit as buying a call. Because of Equation (2), buying the underlying asset and buying a put is called a synthetic long call option. This point is also discussed in this previous post. Here’s the version of the put-call parity involving covered call. 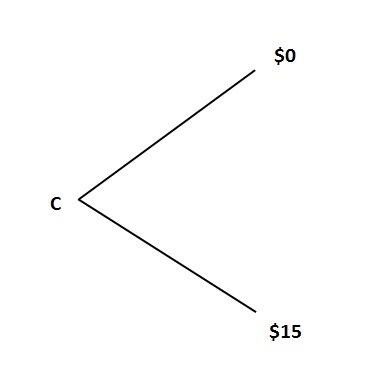 The left hand side of (3) is the time 0 cash outlay of buying the underlying asset and selling a call on that asset (i.e. a covered call). The right hand side of (3) is the time 0 cash outlay of buying a zero-coupon bond costing and selling a put. Thus a covered call has the same cost and same payoff as buying a bond and selling a put. Once again, adding a bond does not change the profit. Thus a covered call has the same profit as selling a put. For this reason, a buying the underlying asset and selling a call is called a synthetic short put option. This point is also discussed in this previous post. As a summary, we gather the various versions of the put-call parity in one place along with their interpretations. Interpretation: Time 0 cost of a long asset = Time 0 cost of (Long Call + Short Put + Long Bond). Interpretation: Net option premium (call option premium that is paid out less put option premium received) = the value of the discount as a result of paying the strike price instead of the forward price. Interpretation: Time 0 cost of (Long Asset + Long Put) = Time 0 cost of (Long Call + Long Bond). The portfolio on the left (Long Asset + Long Put) is called a protective put. Because of (2), a protective put is considered a synthetic long call option. Interpretation: Time 0 cost of (Long Asset + Short Call) = Time 0 cost of (Long Bond + Short Put). The portfolio on the left (Long Asset + Short Call) is called a covered call. Because of (3), a covered call is considered a synthetic short put option. In each of the above versions of parity, the portfolio of investments on the left side is equivalent to the portfolio of investment on the right side. More specifically, each version equates the costs of obtaining the portfolios at time 0. The bond indicated in the interpretations is a zero-coupon bond. A long position on a bond means lending. let’s look at version (2). On the right side, you lend and buy a call at time 0. Then at time , you get back. If the price of the underlying asset at that time is more than , then you exercise the call – using the that you receive to buy the asset. So on the right hand, side, the payoff is if asset price is more than and the payoff is if asset price is less than (you would not exercise the call in this case). On the left hand side, you lend and buy a put at time 0. At time , you get back and you use it to pay for the asset. So you own the asset at time . If the asset price at time is less than , you exercise by selling the asset you own and receive . Thus the payoff on the left hand side is if asset price is more than (in this case you don’t exercise the put and instead you profit from holding the asset). The payoff is if the asset price at time is less than (this is the case where you exercise the put option). The comparison shows that both sides of (2) have the same payoff at time . Then it must be the case that they also have the same cost at time 0. Otherwise, there would be an arbitrage opportunity by buying the side that is low and sell the other side. The basic put-call parity relations discussed in this post can be used in a “cookbook” fashion to create synthetic assets. For example, version (0) indicates that buying a call, selling a put and lending the present value of the strike price has the same cost and payoff as buying a non-dividend paying stock. 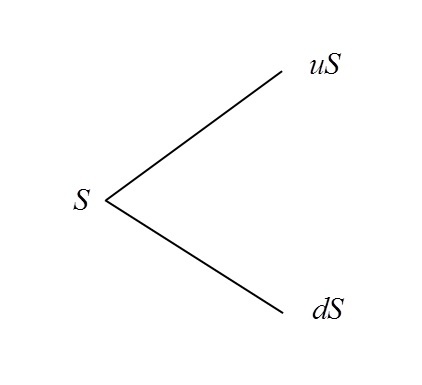 Thus version (0) is a basis for constructing a synthetic stock. In the next post, we discuss the put-call parity for different underlying assets. When a customer buys a forward contract from a market maker, the market maker can create an offsetting position to protect against the risk of holding a short forward position. In this post, we explain how to create a synthetic forward contract to hedge a forward position. This post is a continuation of these two previous posts on forward contracts: An introduction to forward contracts and Putting a price on a forward contract. Let’s say the market maker has sold a forward contract to a customer and the contract allows the customer to buy a share of stock at expiration. The customer has the long forward position and the market maker is holding the short forward position. To offset the risk of the short forward, the market maker can create a synthetic long forward position. The market maker that is in a short forward position will need to offset the long forward position in (1). To do that, the market maker can borrow the amount to buy shares of the stock at time 0. The stock purchase is financed by the borrowed amount. So there is no upfront cost to the market maker at time 0. Now let’s look at what happens at time . The shares will become 1 share at time . The market maker can sell the 1 share to the customer at time , thus receiving . The market maker will also have to repay to the lender, leaving the market maker with the amount . The following table summarizes the cash flows in these transactions. In the above table, the payoff to the market maker is , which is exactly the long forward payoff indicated in equation (1). This means that the process of borrowing to buy shares of stock replicates the payoff to a long forward and thus is a synthetic forward contract. We have the following relationship. If a market maker is holding a long forward position, then he can offset the risk of holding the long forward by creating a synthetic short forward contract. The cash flows in the synthetic short forward contract is simply the reverse of (2). Thus we have the following relationship. Before we discuss how a market maker can use the strategies of (2) and (3) to hedge, we discuss other synthetic positions that can be obtained from relationship (2). 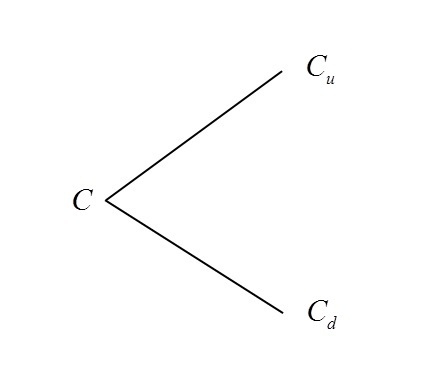 By manipulating the synthetic forward in the relationship (2), we can create a synthetic stock as well as a synthetic bond. If relationship (2) is understood, then (3), (4) and (5) are obtained by rearranging (2). For example, moving a long asset to the other side of the equation becomes a short. To further illustrate the idea of synthetically creating assets, we describe the cash flows for the transactions behind (4) and (5). Looking at the Total row in table 2, the end result is that the market maker pays the time 0 price of shares and obtain the time value of one share. Thus the cash flows in Table 2 create a synthetic share of the stock. The Total row of Table 3 tells us that the end result of Table 3 can be described in this way: the market maker lends out the amount at time 0. At time , the market maker receives the future value of the loan, which is . Thus the cash flows in table 3 create a synthetic zero-coupon bond. If the market maker is holding a short forward position, he can use relationship (2) to create a synthetic long forward to offset the short forward position. On the other hand, if the market maker is holding a long forward position, then the market maker can use relationship (3) to create a short forward to offset the long forward. The following table displays the cash flows involved in hedging using the idea in (2). For easier reference, equation (2) is repeated below. Row 2 in Table 4 is the short bond (borrowing cash has the effect of selling a bond). The borrowed cash is then used to buy stocks (the long stock in Row 1). Rows 1 and 2 form the synthetic long forward. Row 3 is the short forward position held by the market maker. Note that the total cash flow at time is , which is 0 assuming the no-arbitrage pricing principle. Thus the synthetic long forward neutralizes the actual short forward. All the ingredients of the last cash flow – forward price, spot price, risk-free interest rate and dividend yield – are known at time 0. Thus these transactions result in a risk-free position. Table 4 illustrates a trading strategy that we want to highlight. A trading strategy in which an investor holds a long position in a security or commodity while simultaneously holding a short position in a forward contract on the same security or commodity is called a cash-and-carry. When using this strategy, the long position is held until the delivery date of the forward contract and is used to cover the obligation of the short position. Thus a cash-and-carry is risk-free. Table 4 illustrates a cash-and-carry trade from the perspective of a market maker wishing to hedge the risk from a short position. When the cash-and-carry strategy is used by an arbitrageur, it is called a cash-and-carry arbitrage. The arbitrage strategy is to exploit the pricing inefficiencies for an asset in the cash (spot) market and the forward (or futures) market in order to make risk-less profits. The arbitrageur would try to carry the asset until the expiration date of the forward contract and the long asset position is used to cover the obligation of the short position. The strategy of cash-and-carry arbitrage is only profitable if the cash inflow from the short position exceeds the acquisition costs and carrying costs of the long asset position, i.e. , in which case an arbitrageur or market maker can use the strategy outlined in Table 4 to make a risk-free profit. The following table displays the cash flows involved in hedging a long forward position using a synthetic short forward, i.e. using equation (3). For easier reference, equation (3) is repeated below. Row 1 in Table 5 is the short stock – borrowing the shares and sell them to receive cash. Then lend the cash from the sales of the borrowed stock (the long bond in Row 2). Rows 1 and 2 form the synthetic short forward. Row 3 in Table 5 is the long forward position held by the market maker. Note that the total cash flow at time is , which is 0 assuming the no-arbitrage pricing principle. Thus the synthetic short forward neutralizes the actual long forward. As in Table 4, all the ingredients of the last cash flow – forward price, spot price, risk-free interest rate and dividend yield – are known at time 0. Thus these transactions result in a risk-free position. A reverse cash-and-carry is the reverse of cash-and-carry. Thus a reverse cash-and-carry is a trading strategy in which an investor holds a short position in a security or commodity while simultaneously holding a long position in a forward contract on the same security or commodity. Table 5 illustrates a reverse cash-and-carry from the perspective of a market maker. If the cash outflow from the long position is less than the selling proceeds and interest income of the short asset position, i.e. , then the market maker or an arbitrageur can use the strategy outlined in Table 5 to make a risk-free profit. This post is a continuation of this previous post on forward contracts. The previous post discusses the basic features of forward contracts. How to price forward contracts is the subject of this post. Suppose that you need to purchase a financial asset or commodity at time in the future. The price of the asset is right now (at time 0). The price at time is , which is not known at time 0. You can wait until time to buy the asset by paying . Waiting could be risky since the price could increase substantially. So waiting would exposure you to the risk of price uncertainty and as a result profit uncertainty. You can then buy the asset at time 0 (now) and hold it to time . Due to business reasons or other reasons, this may not always be practical. An alternative is to lock in a price today to pay for the asset at time . The dynamics described above can apply to selling too. Suppose you have a financial asset or commodity that will be available for sales at time . You can sell it at time for the price , which is unknown at time 0. Or you can lock in a price today to sell the asset at time . The above scenario is in essence what a forward contract is. In this post, we discuss how to derive the forward price . The focus here is on financial assets, in particular stocks, stock index and currencies. As discussed in this previous post, a forward contract is a contract between two parties to buy or sell an asset at a specified price (called the forward price) on a future date. The forward price, the quantity introduced above, is set today by the two parties in the contract for a transaction that will take place in a future date, at which time the buyer pays the seller the forward price and the seller delivers the asset to the buyer. Trading costs and taxes are ignored. Individuals can always borrow or lend at a risk-free interest rate. Arbitrage opportunities do not exist. In this post, we focus on the pricing of forward contracts on stock, stock indexes and currencies. Assume that the annual risk-free interest rate that is available for investors is . The first case is that the stock pays no dividend. This simple case will help derive the case of paying dividends. Suppose that you want to own a share of a stock at time in the future. Just like the scenarios described above, there are two ways to do this. Buy a share at time 0 and hold it until time . Enter into a forward contract to buy one share of the stock at time . In the first way, you pay at time 0 to own the stock. In the second way, you pay at time to own the stock. In either way you own a share of the stock at time . In the second way, in order to have the amount available at time , you can invest at time 0 at the risk-free interest rate compounded continuously. So at time 0, the cost outlay for the first way is . At time 0, the cost outlay for the second way is . If there is to be no arbitrage, the two would have to be the same. Thus equation (1) gives the forward price on a stock that pays no dividend. The forward price in this case is simply the future value of the price of the asset at time 0. If equation (1) is violated, then there would be arbitrage opportunities. Then traders can buy low and sell high to generate risk-free profit. To see how this work, suppose that . Then you can buy low and sell high. At time 0, borrow the amount and buy a share of the stock. At time 0, also sell a forward contract (i.e. enter into a short forward contract) at the forward price . At time , sell the share of the stock and obtain the forward price and pay to the lender, producing a sure and positive profit . On the other hand, suppose . This time the arbitrage strategy is still to buy low and sell high. You can buy a forward contract at the forward price and simultaneously borrow a share and sell it at the price . Invest the amount at the risk-free rate to obtain at time . At time , buy a share of the stock at the price and then return it to the lender. The amount that remains is , which is a risk-free profit. The above two arbitrage examples establish equation (1) as the correct forward price of a non-dividend paying stock. We now consider the case that the stock pays dividends in known amounts at known times during the life of the forward contract. In other words, this is the case that the frequency, the timing of the dividends and the amounts of the dividends are known ahead of time. To determine the forward price , we still consider the two ways to own a share at time . However, there is now an important difference between these two ways. It is that the owner of the stock in the first way receives the dividends during the contract period while the owner of the forward contract is not entitled to receive dividends. By the time the forward contract owner receives the share at time , she has missed out on all the dividend payments. So the forward contract owner must be compensated for the missed dividend payments. Consequently the forward contract owner should pay less than the price for an outright purchase at time 0. How much less? By the amount of the dividends. So we need to subtract the value of the dividends from the stock price. The price of the first way (outright stock ownership at time 0) accumulated to time is . Thus we need to subtract the cumulative value of the dividends from this price. Here CV means cumulative value. To be more specific, suppose that during the contract period, there are dividend payments received at times . Then the forward price should be subtracting the future values of the dividends at time . We illustrate the forward prices discussed thus far with an example. The price for a forward contract to deliver 500 shares of XYZ 6 months from now, assuming that the stock pays no dividends. The price for a forward contract to deliver 500 shares of XYZ 6 months from now, assuming that the stock pays quarterly dividend of $1.50 with the first one occurring 3 months from now. Then the forward price for the contract is . We now consider an asset that pays dividends at an annual continuously compounded rate that is denoted by . The dividends are paid continuously and reinvested back in the asset. So instead of receiving cash payment, the owner gets more shares. If the investor starts out with one share at time 0, she ends up with shares at time . For a stock index containing many stocks, assuming a continuous compounded dividend rate will simplify the discussion. The forward contract owner wishes to pay for one share of the stock index at time . Again, there are two ways to do this. Buy a shares at time 0 and hold them until time . Enter into a forward contract to buy one share of the stock index at time . In this case of continuous dividends, the dividends come in the form of additional shares. The forward contract owner misses out on the additional shares. So the forward contract owner must be compensated for not receiving the additional shares. Equation (5) indicates that the buyer of the forward contract is compensated by getting a smaller interest rate . So in this sense, the dividend rate is like a negative interest rate. We now illustrate the continuous case with an example. Suppose that a stock with current stock price of $50 pays a 10% continuous annual dividend. The annual continuously compounded risk-free rate is 4%. What is the price for a forward contract for the delivery of 100 shares of XYZ? The contract is to be expired 1 year from now. If you observe a forward price of $49 on a contract on the same stock with the same expiration date, what arbitrage strategy would you use? The forward price for 100 shares is . If you observe a forward price of 49 instead of the true theoretical forward price of 47.088, do the following “buy low sell high” strategy. Borrow to buy shares at time 0. Simultaneously sell a forward contract to buy one share at the forward price $49 one year from now. At the end of one year, becomes 1 share. As the party holding the short forward position, sell the one share at $49. Then repay to the lender. This produces a risk-free profit of $19.12 per share. The profit for 100 shares is $191.2. We use a dollar/euro example to illustrate. Suppose that we want to obtain one euro at time by paying dollars. There are two risk-free rates here as there are two currencies. Let be the risk-free rate of the domestic currency (US dollars) and let be the risk-free rate of the euro (here the subscript stands for foreign). Let be the exchange rate (dollar per euro) at time 0. Once again, there are two ways to obtain one euro at time . The first way is to pay US dollars to buy euros now. Let’s work backward. To get one euro at time , we need to have euro at time 0. Thus we need to have dollars at time 0. We have the following two ways. Exchange dollars into euros at time 0 and hold them until time . Enter into a forward contract to buy one euro at time . Note that equation (6) is just like equation (5). So the risk-free interest rate for the foreign currency plays the role of a continuous dividend rate. One way to interpret the rate difference is that it is the cost of carry for a foreign currency. In this interpretation, we borrow at the domestic rate and invest the borrowed funds in a foreign risk-free account paying at the rate . The earnings from the foreign account will offset the cost of the domestic borrowing. Suppose that a dollar denominated forward contract calls for the delivery of 10 million yens at the end of 6 months. Suppose that the annual continuously compounded risk-free rate for yen is 3% and the annual continuously compounded risk-free rate for dollars is 1%. Currently the dollar/yen exchange rate is $0.008 per yen. Calculate the forward price in dollars for this contract. Thus the dollar forward price per 10 million yens is 10000000 (0.007920399)=79203.9867. One idea emerged in the derivation of the above forward prices is that dividends have the effect of a negative interest rate. The dividend payments are not received by the forward contract buyer since she only receives the stock at the expiration date. As a result, the forward contract buyer must be compensated for missing out on the dividends. In general, if the asset produces income before the forward contract buyer receives the asset, the effect of the missed income would be like a negative interest rate (to compensate for the missed income). This idea also applies to commodity forward pricing. If a commodity has income streams (e.g. it can be leased out), the forward price must reflect this negative interest rate. On the other hand, if a owning a commodity incurs expenses (e.g. storage costs), then the forward contract buyer will have to pay more for the commodity since the forward contract buyer has to compensate the commodity owner for the expenses. The following table summarizes all the forward prices discussed above. The price is the forward price of an asset set at time to be purchased at a future time . All the other variables are as discussed above.